What Edgar, who was admitted to the College as a James Monroe Scholar, didn’t know was how much of the William & Mary experience was made possible by private support. Monroe Scholars, who comprise less than 10 percent of the undergraduate student body, are among the most academically distinguished undergraduates at William & Mary. All incoming freshmen are considered for the program, which supports summer research grants, visiting speakers and other special programs as well as assistance with academic conference travel. The Monroe Scholars program is supported by private gifts from W&M alumni and friends. Edgar, a marketing and sociology double major, became aware of how important private support is to the College when he began working as a student caller for William & Mary Phonathon during his sophomore year. Phonathon employs students who reach out to alumni, parents and friends to nurture relationships and raise unrestricted funds. He is now a Phonathon senior supervisor and president of the Senior Class Gift. “It really surprised me when I started calling for Phonathon and realized how much of our budget is supported by private donations,” Edgar said. Although William & Mary is a public university, state support accounts for only about 13 percent of the operating budget. William & Mary’s second annual One Tribe One Day 24-hour philanthropy challenge, which is one of several initiatives meant to raise awareness on campus and beyond of the impact of private support, is slated for April 21. Last year’s event was a record-setting fundraising day for the university. More than 1,700 students, alumni, parents, faculty, staff and friends made a gift during last year’s One Tribe One Day event, shattering William & Mary’s previous record of 523 donors in a single day. Events like One Tribe One Day and Tag Day, during which certain buildings and people on campus benefiting from private support are tagged, are helping to raise awareness among students, Edgar said. He noted the importance of showcasing the wide-ranging tangible impact of private support on the student experience at the College, including scholarships and research opportunities, endowed professorships and even buildings such as the Cohen Career Center and Alan B. Miller Hall, home of the Raymond A. Mason School of Business. Edgar made his first gift to the College last year as a junior, and he is a leadership-level donor to his Senior Class Gift effort. Like Edgar, Hillary Huttenhower ’05 also was a Monroe Scholar who started giving back early. Huttenhower, a materials engineer who now lives in Manchester, Conn., has continued to support the College as an alumna, making regular contributions to the Fund for William & Mary, which provides unrestricted support for the College’s most-pressing needs. 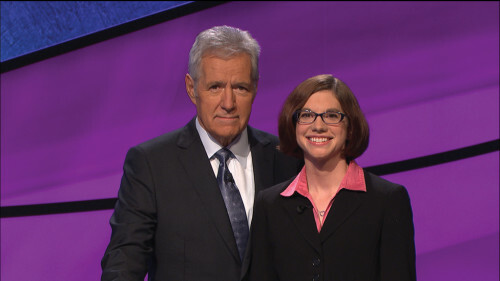 Late last year, Huttenhower had the opportunity to fulfill a longtime dream of appearing on the syndicated game show “Jeopardy!” Huttenhower, who earned a bachelor’s in chemistry at William & Mary, won during her first appearance on the show and finished second during her second appearance. Who is Hillary Huttenhower ’05? After two appearances on “Jeopardy!” last year, she made a gift and multi-year pledge to William & Mary. “I had been trying for so long to get on the show, and then, all of the sudden, to actually be there was quite an experience,” she said. Following her “Jeopardy!” appearances, Hutten-hower made a gift and a multi-year pledge to W&M. Despite her loyal support of the College, Huttenhower said there was little awareness among students of the value of private support when she attended William & Mary. She agreed with Edgar that events like One Tribe One Day are good ways to draw attention to William & Mary’s needs. Edgar said the university is making strides in terms of educating current students about the value of philanthropy at William & Mary, even if they can only give a small amount. The Senior Class Gift will host activities centered around One Tribe One Day. Edgar hopes his classmates will support the College as students and as alumni. “As a senior class member, I would want to come back in 25 years and be able to see that stone over by Tucker Hall that showcases our high participation percentage,” he said.